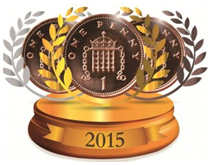 It is with great pleasure that we announce the Pennies from Heaven 2015 Award winners. The Pennies from Heaven Awards are given every year to celebrate fundraising excellence. It is our way of endorsing organisations that not only support charitable giving in the workplace but do so exceptionally well. They are not just certificates to hang on the wall or logo’s to post on a website but a hard earned opportunity to tell staff and customers how great you are! Our winners have achieved something great and we hope by recognising this the Awards raise the profile of the scheme even further and encourage even more people to join in. Bronze medals are awarded to employers with more than 10% of staff participating in the scheme, Silver to those with over 15% and Gold to those with more than 20%. The Chairman’s Award in 2015 has been awarded to Mencap who have demonstrated continued and growing support for the scheme. Having launched the scheme in 2010 Mencap has seen participation rates steadily climb from 16% in 2012 to 27% in 2014. Today 1 in 4 employees has signed up to Pennies from Heaven donating over £1,000 a month. In total the scheme has raised >£35,000. Of course the real winners are all of the charities that have benefited directly from all of the donations – they really do appreciate every single penny. 2014 was another incredible year for Pennies from Heaven. The scheme has seen a continued rise in its popularity with employees with the average participation rate rising to 18% (up 20% from 2014). Pennies from Heaven will give out more Awards than ever before up 30% from 2014. In the last 12 months employers such as EY, The Financial Ombudsman Service, National Oilwell Varco, Friends Life, RR Donnelley, UK Asset Resolution, Chelmsford City Council, NHS Gloucester CCG, Oxleas NHS Foundation Trust, The Rank Group and Solihull CCG have all joined the scheme. Sixty one new charities have also benefited from Pennies from Heaven donations for the first time. See all our lovely testimonials from Award winners here. May we congratulate all of our winners on their achievements and thank you on behalf of all of us at Pennies from Heaven for your ongoing support. There can be little doubt that little pennies are making big changes. “This demonstrates that our pennies from payslips are making a big difference to the charities we support. It’s very simple for our employees to join the scheme and an easy way to donate to the charities nominated” Clare Jackson, LV= Payroll Officer. None! Everyone went for Gold and achieved it!